Jeremy brings over 25 years in the hospitality industry to Cascadia Liquor and a wealth of experience working with guests to find that perfect bottle for any occasion. In 2012, he achieved his Sommelier Diplomat from the International Sommelier Guild to complement his strong service-focused approach. Jeremy also has a big passion for craft beer and has recently attained the Cicerone Certification (while adding to his craft beer cellar along the way). Before joining Cascadia, he owned and operated a restaurant in the Rocky Mountains before leaving it all behind for the beautiful West Coast. Ann is passionate about all things wine and she loves sharing that passion with our guests and our team. She has accomplished multiple qualifications including Court of Master Sommeliers and Certified Sherry Specialist. She is currently working on the challenging the WSET Level 4 Diploma to earn a Specialist-level knowledge in wines and spirits. 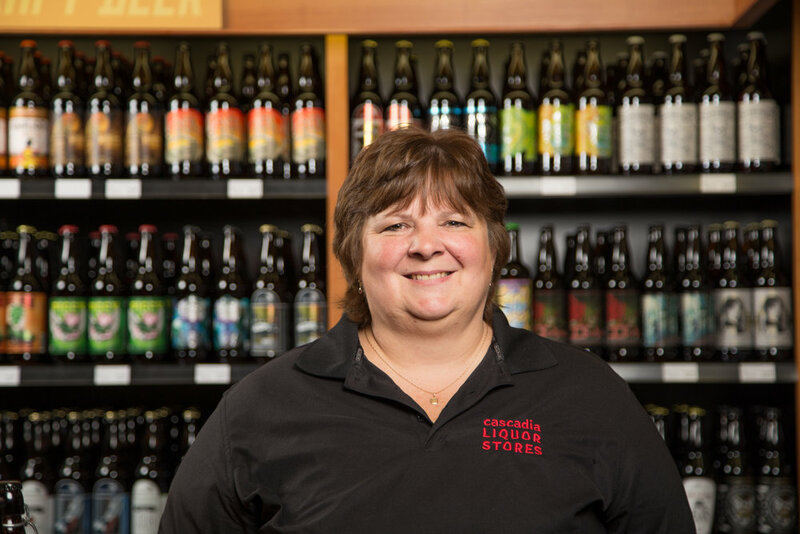 Ann’s mission is to educate our team to further improve that expert level service and amazing selection you’ve become accustomed to at Cascadia Liquor. Jay and his team are excited about creating an amazing new shopping experience at Quadra Village in Victoria. Jay has extensive experience in hospitality and bartending. Like any good bartender, Jay is happy to chat and help you find the right ingredients for your next event. Tip - ask him to help pick out a great bottle of bourbon. With a background of over 35 years in hospitality and liquor retail, Cathy leads a team that constantly strives to exceed the customer's expectations. Cathy is always available to help you find that perfect bottle of wine, or show you the latest hard-to-find craft beer release. 12 years of working for Labatt leaves Jeff chocked full of knowledge. He and his team are at your service to help find the perfect drink and make your night an experience. Tickle Jeff's fancy by asking about his international wine collection. Jeff Reid comes to us from Vancouver with 20 years of hospitality experience, including operating the iconic Roxy nightclub and owning and operating his own venue, Crush Champagne Lounge. If you're looking for that extra special bottle of Gin, Jeff's your man. Jessie has been working in hospitality for over 15 years, spending time in hotels, restaurants and liquor retail. While working at the Fairmont Chateau Whistler she developed an interest in wine which led her to pursue further education in both wine and beer. Stop by Eagle Creek today and she will be happy to help you pick out that special bottle, or her favourite Rosé. Curiosity encouraged Neely to delve deeper into the beverage industry. She has spent the last 20 years in multiple roles: retail manager of liquor stores & VQA stores, sales representative, winery tasting room manager (even grape picker! ), and now thankfully for us, manager of our Langford location. Don't hesitate to ask Neely anything about wine - her passion for connecting it to geography, history, terroir and the intrinsic pleasure of experience is contagious. Rick has been working in retail and customer service for over 19 years, including 2.5 years with Cascadia Colwood. Originally from Ontario, he is looking forward to making Nanoose Bay his new home with his wife Miranda, daughter Penelope and their dog Shamus. Rick thoroughly enjoys interacting with his community and customers inside and outside of the store. He loves the outdoors, the environment and there isn’t a type of drink that he doesn’t have something to say about.